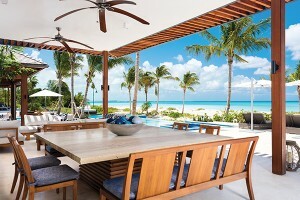 Conceived as a multi-generational beachside family estate, Hawksbill Estate is extravagant in size but personal in detail. 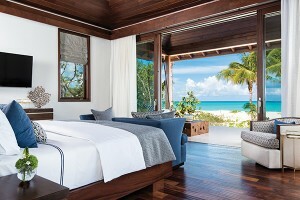 Fringed on one side by the pristine sands of Grace Bay, Providenciales, and on the other by a canal, Hawksbill Estate hunkers down between sea grapes and coconut palms, its low profile belying the fact it houses eight bedrooms and sport and leisure facilities worthy of a wellness resort. 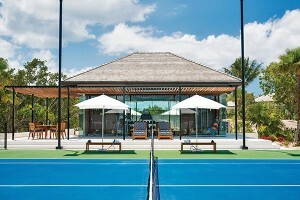 For the owners, a Chicago-based couple with six grown-up children and a growing brood of grandchildren, creating a vacation home that could comfortably accommodate the whole family and cater to their active lifestyles was inevitably going to mean thinking big. The conundrum was how to go big, without losing intimacy. 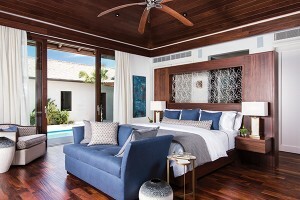 To help solve the puzzle, the couple hired TCI-based architecture and interior design firm Coast, to help them create what would turn out to be a main house with five bedrooms, a standalone master suite for the owners and a separate two-bedroom guest house. "It was important to us that the design fit into to the surroundings, so instead of one huge house, we designed a series of low-rise buildings, that allow privacy and a degree of independence for all," the owners explain. "It also means that we can shut off the parts that are not in use when it’s just the two of us, and just use the den, kitchen and master suite." Because the whole family are self-confessed health and fitness fiends, the home had to include a gym, tennis court and basketball court, a lap pool for the husband, and a chef’s kitchen large enough for the family to cook together, all in addition to ample accommodation. 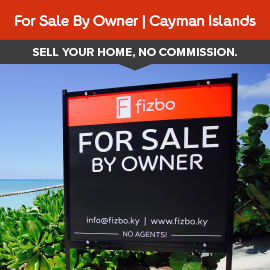 Having a keen interest in architecture and design themselves – she dabbles in interior décor projects at home, he is involved in the commercial side – the owners were deeply involved in every decision, down to the selection of doorknobs and fabrics. 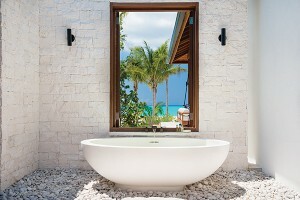 As well as replicating inspiring ideas they found in magazines and books – such as the distinctive walnut staircase that appears to float in front of a natural stone wall and the bathroom courtyard, where an oval tub sits under an open sky with a window onto a picture postcard view - they incorporated many features that had personal meaning for them. A freeform live edged headboard in one bedroom and the coffee table that sits under soaring timber ceilings in the centre of the vast, airy great room, were both cut from a felled walnut tree on another of the owner’s properties. 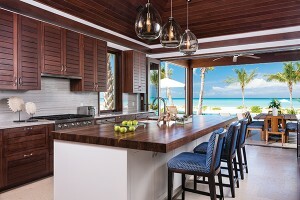 The kitchen, where a single gleaming slab of hardwood forms the island countertop, is a copy of their kitchen at home and the square stone table on the screened-in terrace (“A square table is just so conducive to conversation,” they enthuse) had been on their wish list for years. The genius of the design is that, despite the scale, it maintains a sense of continuity and warmth. By using the same flooring throughout and matching bathroom cabinets, there is a coherence and unity to the overall design, while features such as the cluster of pendant lights that hang in the centre of the great room fill what might otherwise have been too large a space. An emphasis on natural materials and an eclectic mix of antique mirrors, unusual wall coverings, sea-themed decorative features and locally commissioned artwork all add warmth, texture and personality to each space. 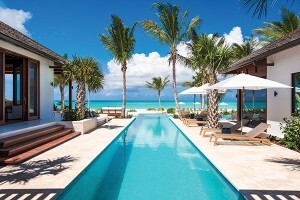 With eye-catching details and inviting nooks scattered across the five-acre estate, the challenge now is choosing which spot to savour: the day bed in the centre of the pool, the fire pit on the beach, or the snug family room with its unique curved couch? Completed in February 2015, Hawksbill Estate was no small undertaking, especially given the international nature of the project. 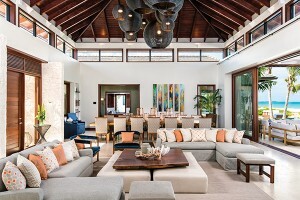 The spirit of collaboration between architects, interior designers and owners, however, was the highlight. "It seems that whatever idea we had, they took it and made it better," the owners say. Now, having had three years to live in and enjoy the space, they can safely say there is not a single detail they would change.